Familiar name sits atop our 2018-19 national preseason rankings. Montverde Academy (Montverde, Fla.) captured its fourth GEICO Nationals title last season, finishing an unblemished 35-0 campaign with the MaxPreps National Player of the Year in R.J. Barrett and our National Coach of the Year in Kevin Boyle. The Eagles have been the most dominant team in high school basketball over the past six seasons, compiling a remarkable 172-10 record over that span. This year could be much of the same for the Sunshine State juggernaut. The roster has been replenished with the deepest collection of elite talent high school basketball has seen in quite some time. Coming in at No. 2 and 3 in the rankings are Oak Hill Academy (Mouth of Wilson, Va.) and IMG Academy (Bradenton, Fla.), respectively. Both teams have reloaded in unprecedented fashion and appear to be in a league of their own with the top-ranked Eagles. With the abundance of high school basketball talent across the country, hundreds of teams were considered and will have a chance to play their way in over the course of the season (look for our expanded Top 100 in early November). 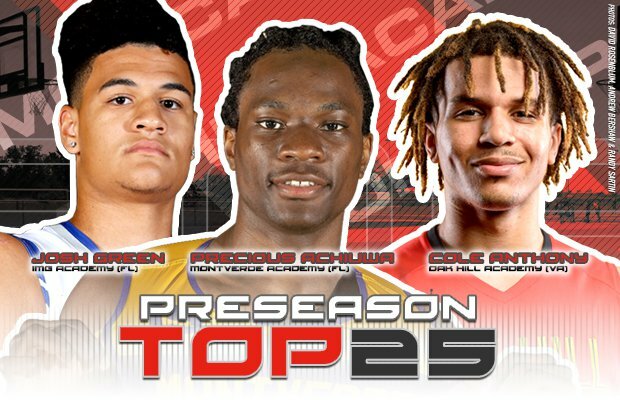 Read on for a look at the complete Preseason Top 25. 2017-18: 32-5, No. 8 national ranking, lost to Montverde Academy in GEICO Nationals semifinals, 71-53. 2017-18: 29-4, lost to Roselle Catholic in NJSIAA Non-Public B championship, 63-61. 2017-18: 32-2, No. 16 national ranking, beat Whitney Young in IHSA Class 4A state championship, 60-56. 2017-18: 26-0, No. 15 national ranking, beat Federal Way in WIAA Class 4A state championship, 54-52. 2017-18: 29-4, No. 23 national ranking, beat Bishop Manogue in NIAA Class 4A state championship, 62-41. 2017-18: 27-2, lost to Gonzaga Prep in WIAA Class 4A state championship, 54-52. 2017-18: 36-4, lost to Tompkins in UIL Class 6A state championship, 80-76. 2017-18: 32-4, No. 24 national ranking, beat McGill-Toolen in AHSAA Class 7A state championship, 74-48. 2017-18: 22-7, lost to Garfield in WIAA Class 3A state championship, 72-63. 2017-18: 29-4, No. 25 national ranking, beat Don Bosco Prep in NJSIAA tournament of champions title game, 61-52.